You might have long forgotten about the time when Apple allowed third-party manufacturers to clone the Mac back in 1994, but former Cupertino employee Dave Garr certainly remembers it. Facing stiff competition from a bludgeoning Microsoft, the Big A – then headed by CEO Michael Spindler – entered into an unprecedented licensing agreement with Power Computing and several other companies, granting them the rights to build and sell computers running the Macintosh operating system. While the licensing deal ultimately proved to be a gigantic failure within a few years, employees regarded the move as a big step for Apple at the time – big enough to upset the then-current market dynamics and help the company catch up with Microsoft, whose software had confidently become the standard by then. This is when Garr and a small group of fellow Apple employees decided to record a series of parody songs to mock the competition and celebrate the “new era” of Macs. Among these was a dorky music video called I Think We’re a Clone Now, a satirical cover of the popular hit song I Think We’re Alone Now. Featuring Garr and his “stunning” vocals, the video was recorded in 1994 at Apple’s corporate headquarters, 1 Infinite Loop. Taking digs at competitors like Microsoft, Dell and Intel, the song is full of playful references to Apple’s powerful technology as well as its newly-restructured business model; though, to be fair, most of these come across as painfully cringeworthy these days. Years after it was originally recorded, the video appeared on The Guardian and Wired after blogger Michael Gartenberg shared it in a now-deleted post on Jupiter Research. Since then, Garr has re-uploaded the video on his own YouTube channel. 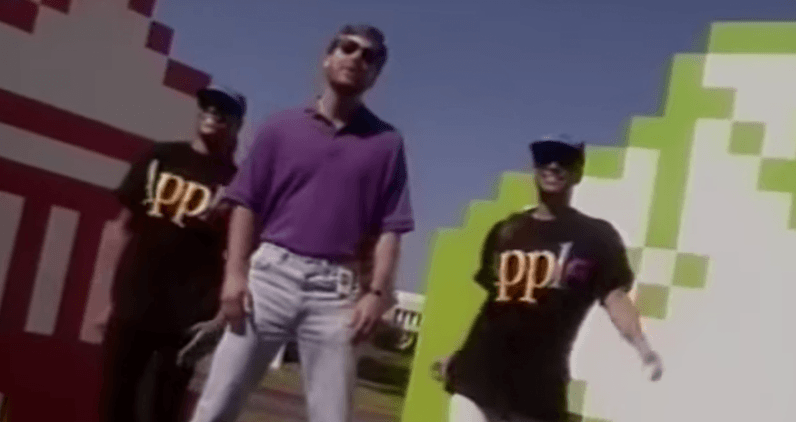 But the best part is that, in addition to I Think We’re a Clone Now, the former Cupertino employee has also shared some other Apple-inspired parody songs he and his colleagues recorded back in the day. Much like I Think We’re a Clone Now, the songs are satirical covers of old hits like MC Hammer’s U Can’t Touch This, Charles Fox’s Killing me Softly with His Song, Smokey Robinson & The Miracles’ The Tears of a Clown, and The Jackson 5’s I Want You Back. As you can expect though, all of these use various plays on words to mock Microsoft and Windows. In case you’re wondering how the licensing era ended… Steve Jobs eventually put an end to the agreement shortly after he returned to Apple in 1997, purchasing Power Computing’s entire Mac cloning business for $100 million. So in a way, all that’s left from these exciting times are Garr’s soothing vocals. Better enjoy them thoroughly.